Lloyds Bar, opposite the road to Dene’s Blue Hole on Queen’s Highway. Athlete welcome and registration, Vertical Blue 2015, Lloyds Bar, opposite the road to Dean’s Blue Hole on Queen’s Highway. Opening address / Briefing / Vessel delivery from the Fluid States New Delhi cluster convenor, Rustom Bharucha. 9-1pm Day 1, Act 1: Vertical Blue, at Dean’s Blue Hole. Guests: Mick Douglas (Artist), Howard Holtzman (architect), Stig Severinson (free-diver), Amelia Taverner (artist), and Daan Verhoeven (photographer and freediver). These events are held to provide opportunity for discussion and dialogue around Deep Anatomy and the Vertical Blue competition. It is called the ‘Intersection Talks’ because they will be held at the crossroads next to the Blue Hole, and because of the intention to bring together various communities to find more out about each other: the athletes, the artists, local Long Islanders, and other visitors to the island. Everyone is welcome to attend, and join in the discussion afterwards. Each of the invited speakers will have 6 minutes and 40 seconds to talk, in the famous Pecha Kucha format, where they choose up to 20 images to go with their talk as a slideshow. The slides will change every 20 seconds to complete the 6’40” duration for the presentation. It is short, concise, and fun! Lloyds Bar, opposite the road to Dean’s Blue Hole on Queen’s Highway. Guests: Denise Batchelor (artist), Carla-Sue Hanson (freediver and artist), Katarina Linczenyiova (freediver), Sara Malou-Strandvad (performance designer), Dian Knowles (LI Journalist), and others TBC. 6pm Vertical Blue Awards and Party, Lloyds Bar, opposite the road to Dean’s Blue Hole on Queen’s Highway. Freediving champion William Trubridge and performance designer Sam Trubridge tell the story of their collaborations together, projecting images onto the cliffs of the Dean’s Blue Hole to create a beautiful light show. 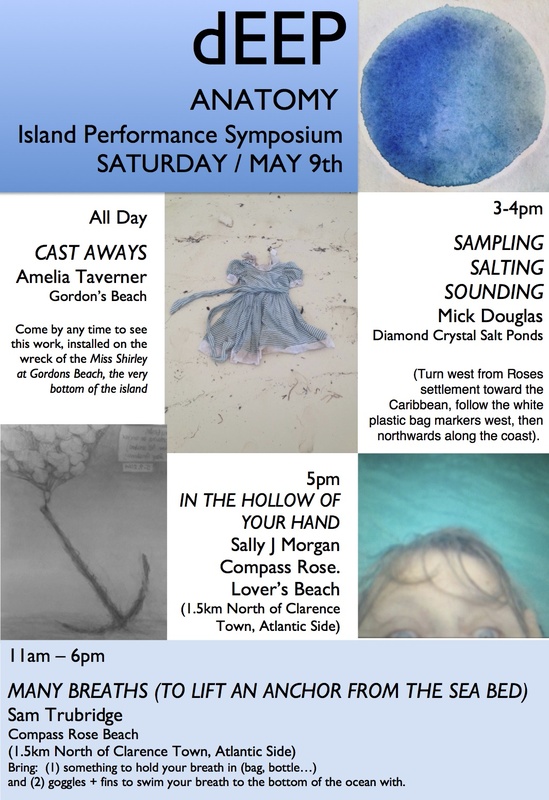 A day of performance works and installations across Long Island. Public Forum. Everyone is welcome to join this forum and workshop, where Deep Anatomy contributors will share the results of their work over the past two weeks and engage in public discussion about the event. A ‘vessel’ will be prepared that we can send to the next Fluid States cluster in Santorini, Greece.